“It looks like teeth in the river,” explained Army Corps of Engineers Public Information Officer Todd Hornback. The wickets, which are about four feet wide and 20 feet long, are crucial to controlling the water levels for river traffic. Hornback said three wickets broke free from their bases at Dam 52, near Paducah in western Kentucky. The closed section of river carries approximately ninety million tons of waterborne goods annually. How long the river is closed will depend in part on river conditions and whether Mother Nature helps raise the water level. “Rainfall is part of the process and we can’t control that ,” Hornback said with a chuckle. A repair crew at work on Dam 52 in 2013. The wicket system dates back to the 1920’s when the lock and dam was built. All wickets are raised and lowered by hand and all repairs must be made by hand. The age and deteriorated condition of the wickets makes frequent repairs necessary to keep Dam 52 functioning. 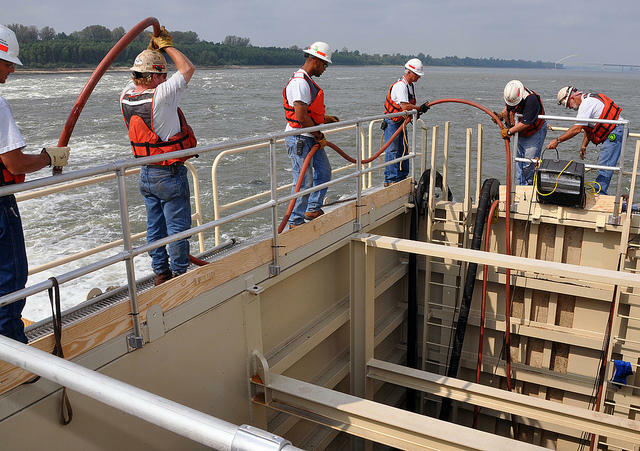 The ArmyCorps is at work on a replacement project downriver at the Olmsted Locks and Dam, scheduled for completion in 2020.